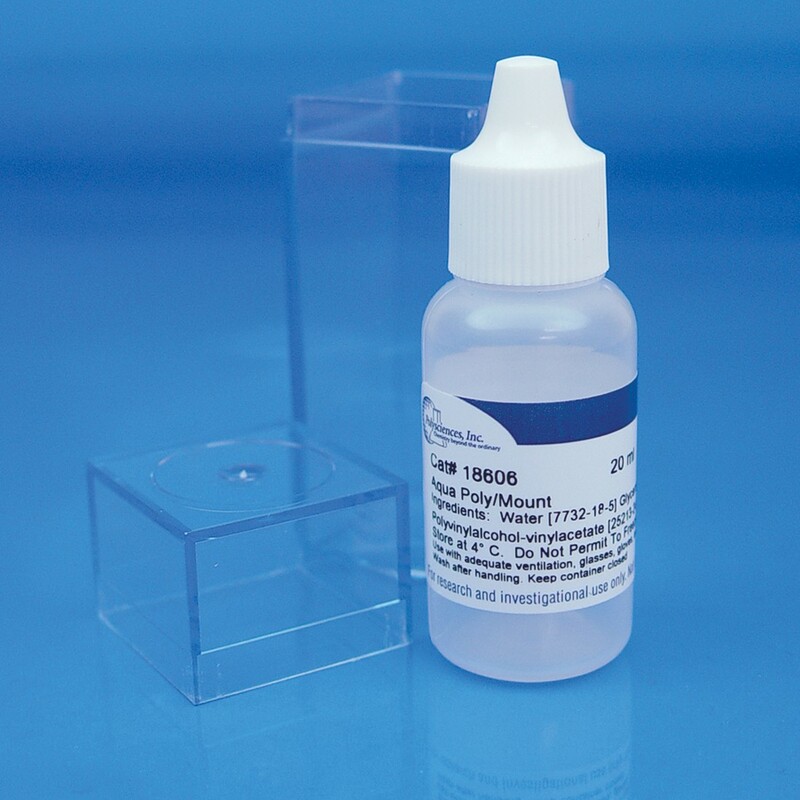 Aqua-Poly/Mount can also be used for frozen sections, fat stains and immuno-stains where aqueous mounting media is required. Aqua-Poly/Mount can be used with most fluorescent dyes and stains including DAB, Alkaline Phosphatase-Fast Red, AEC (aminoethylcarbazole) and other chromogens that are alcohol soluble or incompatible with organic solvents. Aqua-Poly/Mount solidifies under the coverslip after 24-48 hours at a relative humidity of 20-50%. After it dries completely it forms a solid, clear seal that facilitates handling and storage, making painting of the coverslip edges unnecessary. Aqua-Poly/Mount can be used on automated coverslippers in place of traditional solvent based coverslipping medium. Cui C, et al. (2013). Wdpcp, a PCP protein required for ciliogenesis, regulates directional cell migration and cell polarity by direct modulation of the actin cytoskeleton. PLoS Biol. 11(11):e1001720. Doh YJ, Kim HK, Jung ED, Choi SH, Kim JG, Kim BW, Lee IK. (2009). Novel LMNA gene mutation in a patient with Atypical Werner's Syndrome. Korean J Intern Med. 24(1):68-72. Li F, Vallabhaneni R, Yu J, Rocheford T, Wurtzel ET. (2008). The maize phytoene synthase gene family: overlapping roles for carotenogenesis in endosperm, photomorphogenesis, and thermal stress tolerance. Plant Physiol. 147(3):1334-46.